The conclusion to this dramatic science-fiction tale warps everything up nicely... I think. I wasn't having a very good month. It began with my great-grandmother having a stroke in early October. Then, on the 8th, my house was burglarized by sub-human slime bags who took a liking to my XBox, Gamecube, 7 other video game systems, my Samba de Amigo maracas, about 16 games, 30 controllers of various types, some speakers, my phone...and so on. I've been working full-time at a mall bookstore while looking for a "real" job while helping my parents build a new house (another full-time job, really), and that, combined with the stress from the robbery and a change in weather, helped me get miserably sick a week later. Unable to do anything else, but determined not to just sleep, I popped in the final two discs of Brain Powered (not at the same time, silly) and tried to get some other work done. It actually made me feel quite a bit better. Brain Powered is essentially a character-driven drama. Sure, it contains giant robots, impressive battles, clandestine conspiracies, and political intrigue, but more than anything, this is a tale about the human race and what we need to do to survive in the future. After millennia of slumber deep below the ocean's surface, an extra-planetary sentient object known as Orphan has begun to surface, creating panic and chaos all over the Earth. Some scientists theorize that it is going to leave the planet, sucking away all of the life energy on Earth in the process, to search for a mate, while others (the main protagonists, in particular) believe that it is possible to co-exist with the enormous being. In this collection, we finally discover Orphan's desire as Brain Powered comes to an end. Most of the action is depicted from the perspective of the crew of the Novis Noah, a counter-agent to Orphan designed to protect and foster humanity against the mounting threat Orphan presents. There's a Ranma-sized cast for this show, and the inter-character relationships are complex and constantly changing, even to the very end. Hime and Yuu finally begin to accept their feelings for one another in this set, and I honestly find their awkward, immature love for one another to be very endearing. Many plot points are wrapped up nicely, but I don't want to give away too much, so I'll avoid spilling any more details. I found the emotional moments of the show, such as when Yuu is forced to deal with the consequences of Nelly's death, or when Jonathan comes to terms with his feelings for his mother (and vice versa), or when Yuu is reunited with his sister, to be very cathartic. After the downer of a month that I'd been having, it was an unexpectedly pleasing release of all of the pent up rage/sadness/annoyance that I'd been collecting for a few weeks. I was a fan of the story of this series from the beginning, and I personally believe it's a strong tale to the end. This is a fairly new show, and the visuals are clean and crisp. There's a good use of colors, and this collection shows a far wider range of character designs than any of the previous discs. The primary characters all look far too good to be realistic, but the same can be said for most animation. The box art doesn't exactly make me want to buy the show, but then it usually takes more than a pretty picture to get me interested in something. The case itself is a hard plastic DVD keepcase with a hinged holder for the second disc. I really appreciate the fact that the entire series (all 26 episodes) was published in just three two-disc volumes. It's nice not having to wait a year or more just to watch a season of anime. Sure, the MSRP is higher than normal, but savvy shoppers can find most DVDs at half the standard retail price. Just check out http://www.dvdpricesearch.com if you don't believe me. The music is better than average, in no small part due to the fact that Yoko Kanno is the show's composer. It doesn't have the insane variety of styles or huge library of compositions Cowboy Bebop has (see my other review this month), but it's certainly well done. The Japanese voice acting is impressive, and quite possibly one of the reasons why I like this show so much. Each performer adds just the right amount of emotion without tipping the scales of the show towards melodramatics. The English dub seems to have good performers, but I've come to the conclusion that I hate any sort of word-fitting software. For some unfathomable reason, certain people believe that English-speaking fans of anime will only accept a show if the lips of speaking characters are exactly in synch with what they say. They always ignore the facts that 1) anime is not usually animated to match voice acting and 2) even if it were, it would synch with Japanese, not English, anyway. Either way, it produces some frighteningly unnatural dialogue, making perfectly good English voice actors sound goofy. If you can't stand reading subtitles, you'll hear the dub anyway, but I can't say it's a better-than-normal recording. 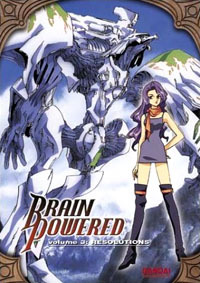 Brain Powered is a far more intelligent show than it may appear, purposefully trying to show a sci-fi story from a feminine perspective. Behind the mechs, organic shields, and the impending end of humanity, there's a good tale with interesting characters unfolding here. Oh, and for those of you who were worried, things are significantly better than they were at the beginning of the month. After I watched Brain Powered, my fever broke (though I'll be the first to say that correlation does not imply causation) and the next day I was well enough to see my favorite live band in concert (the Funk extravaganza, Hazard to ya Booty). Things picked up even more when my birthday came along ('twas a good haul this year!) and I found out that our store was going to carry Newtype. I suppose the only nice thing about bad stuff is that it makes the rest of your life seem so much happier. I still have my friends and family, and I still get to write about what I love.